William Baines was born on the 26th March 1899 and baptised at Horbury Primitive Methodist Chapel on the 30th April that year. He was the son of George William and Mary Alice (nee Townsend). William spent his early years living at 11 Shepstye Road. The 1901 census describes his father George as a bricklayer’s labourer and organist. George was the organist at the Primitive Chapel, which was on the site now occupied by Lucky Flower Chinese takeaway and Bar 42. Young William would join his father on the organ bench while he played. When he was 4 years old the family moved to a music shop opposite the chapel, which his father went to run. In 1906 George and Mary had a second son, Edward Henry. 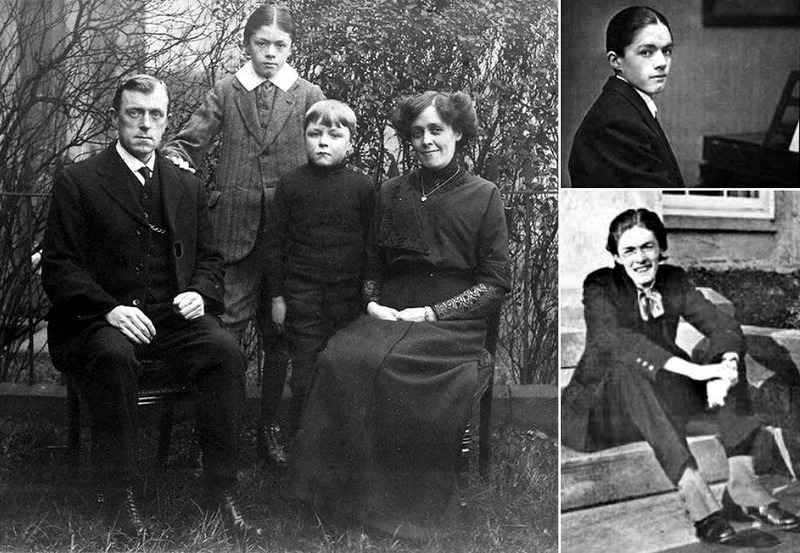 Above Left: William Baines with his parents, George William and Mary Alice Baines, and younger brother Edward Baines. Top Right: William Baines as a teenager. Bottom Right: William Baines shortly before he died of abdominal tuberculosis in 1922. William began learning piano with his father at a young age and by 1907, serious lessons were being undertaken. Young William attended the Wesleyan Day School on School Lane. George Baines was a man of fairly modest means and couldn’t afford a top class musical education for his son. He did however send him to study under Albert Jowett at the Yorkshire Training College of Music, Leeds in 1910. William progressed rapidly and by the age of 12 was writing tentative compositions. The 1911 census shows the family living at 16 Church Street, although I am reliably informed this was demolished quite some years ago. The family also lived at 14 Barker Road at some point too. 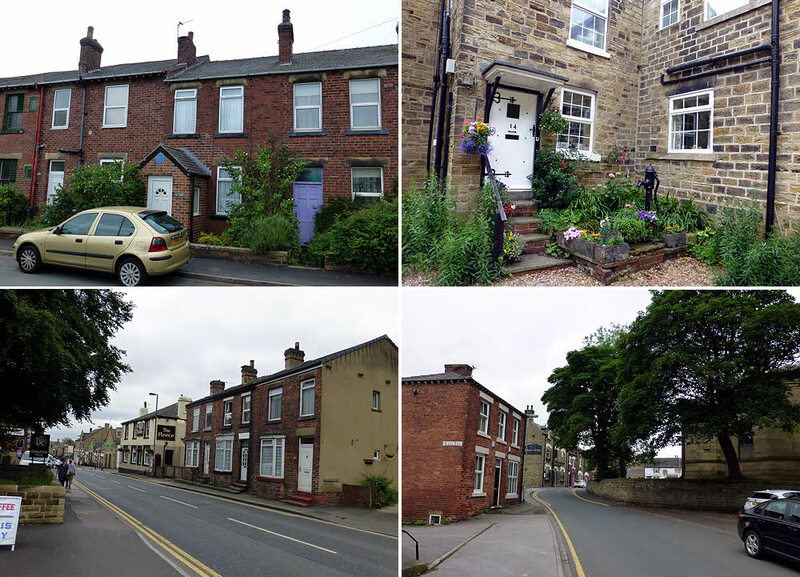 Above: Some of the Horbury houses and shops associated with the Baines family. Top Left: 11, Shepstye Road, Horbury with a blue plaque to commemorate William Baines living there. Top Right: 14, Barker Road, Horbury, where the Baines family lived at one time. Bottom Left: the houses opposite the Lucky Flower Chinese takeaway and Bar 42 in Horbury, where the Music Shop that William Baines' father worked. Bottom Right: Church Street, Horbury where the Baines family were living in 1911. In 1913, the family moved again, when George took up the position of cinema pianist at Cleckheaton Picture Palace, a role he had fulfilled at Horbury cinema too. Sometimes a young William would deputise for him. In 1916, George secured another cinema role, this time as musical director of Fossgate Cinema, York. The family moved to 91, Albermarle Road, York, although William remained in Cleckheaton for a further year, taking over his father’s role at the cinema. When William eventually joined his family in York, he continued to deputise for his father. During his first year there, 17 year-old William composed his "Symphony in C Minor" – quite an achievement for someone who had never actually heard one. This was his first diary entry alluding to his ill health. The First World War was not yet over and this was also the day he received his papers informing him he was to be re-examined by the army. He had been examined and deferred on health grounds three times already. This time however he was deemed fit for light clerical duties. On the 4th October 1918, he began his war service. He was stationed at Blandford Camp, Dorset, rumoured to have the worst conditions in the country. After only a fortnight in the cold, wet, influenza-ridden camp, he contracted septic poisoning. His parents received a telegram stating: “Come at once. Your son is dangerously ill.” His parents were with him 24 hours later. His mother stayed for a month – until the Armistice was signed. Above: William Baines and his father George worked as cinema pianists during the era of the silent movie. The Baines family moved from Horbury to live first in Cleckheaton and then in York. 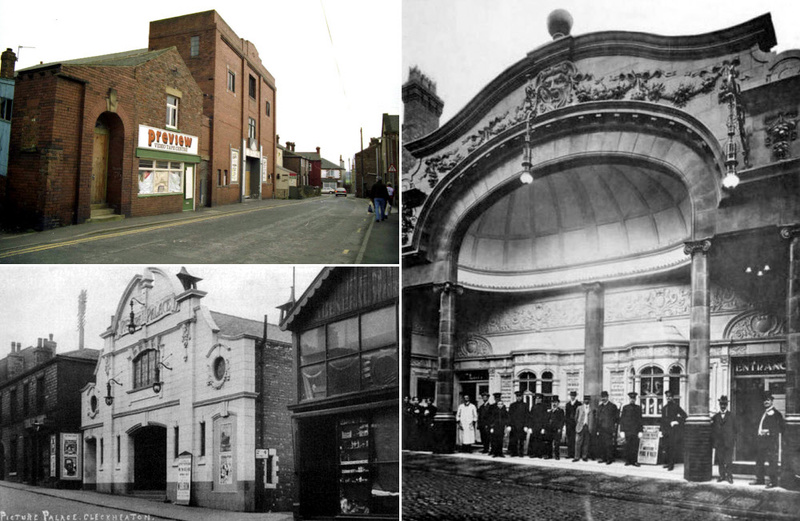 Top Left: Horbury Cinema. Bottom Left: Picture Palace Cinema, Cleckheaton. Right: Fossgate Cinema in York. William was then transferred to York hospital and was eventually allowed home on the 24th January 1919 for a demob party. There he met Edith Milner, who would enlist William to play several recitals and Karl S. Wood, a pianist, poet and artist. Wood introduced William to the nuns at St Mary’s Convent, Micklegate Bar. They allowed a convalescing William to practice for concert engagements there. He formed a close friendship with Sister Mary Bernard, whom he dedicated his "2nd Prelude" to. At Wood’s suggestion, William submitted manuscripts to Elkin’s publishers, London and they soon asked him down to play for them. They agreed to publish "Paradise Gardens" and the "Seven Preludes". Back in York, William was introduced to J. E. Kennedy, who allowed him access to his complete works of Scriabin’s piano music, which was to have great influence over his later work. This year also saw William working on his "Violin Sonata", his first concert study, "Exaltation" and "The Island of the Fay". In January 1920, William had a telegram from Dr Arthur Eaglefield Hull, the founder of the Huddersfield College and a renowned musical dignitary of the time. When William played for him Eaglefield Hull was immediately impressed and enrolled him in the British Musical Society, which he also founded. Encouraged by this attention and enthusiasm, William wrote "Radiance", "The Naiad" and "Rhapsody" for string quartet. In the British Musical Bulletin of March 1920, Eaglefield Hull wrote an article entitled, "Hats off, gentlemen, a genius! ", a phrase first written by Schumann about Chopin. Eaglefield Hull declared he was "prepared to abide by the consequences." William however, was not convinced by the consequences. Journalists started writing letters and making frequent visits to his home, asking for interviews. William was now firmly in the public eye. Invitations for concerts, publishing enquiries and reporters were arriving daily. Unfortunately, it coincided with another decline in his health. William travelled to Bridlington for a month but returned in a bath chair. He remained very weak throughout the next few months and decided to return to Bridlington but not before writing "Goodnight to Flamboro’". After another month on the east coast he returned home and by September was able to begin composing again. In late 1920, William received an invitation to go and play for a famous pianist called Frederick Dawson. William had previously sent him some manuscripts and after meeting, a great friendship began. Dawson began to regularly include William’s work in his recitals and with gratitude William dedicated "Silverpoints" and "The Naiad" to him. In early 1921, he was introduced to Benjamin Dawson (no relation to Frederick Dawson) by Edith Milner, who with his wife had moved into Edith’s former home, Nun Appleton, South west of York. It was made famous by the poem "Upon Appleton House" by Andrew Marvell. Much of William’s ‘nature music’ was composed here, including "Twilight Woods" and "Glancing Sunlight". Later that year William made a visit to the Henry Wood Promenade Concerts with Benjamin Dawson. He was particularly impressed by hearing Scriabin’s 2nd Symphony. Above: Horbury Primitive Methodist Chapel before demolition, which was located where the Lucky Flower Chinese takeaway and Bar 42 are now located in Horbury. Bottom Left: The Baines grave in Horbury Cemetery. 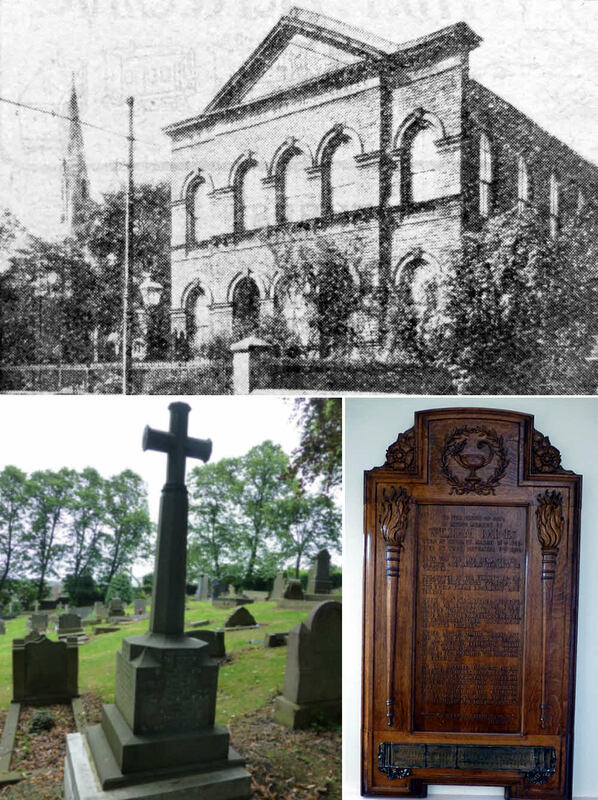 Bottom Right: The oak memorial tablet that was placed in the Primitive Methodist Chapel in 1924 after the death of William Baines. By the end of March the following year, William’s health began to fail once more. Even another visit to Bridlington did no good. In April he wrote his final composition "Pool-Lights" from "Pictures of Light". He still managed the odd visit to Nun Appleton but was soon confined to bed by the doctor. On the afternoon of the 6th November 1922, while clasping his father’s hand, William died, age only 23. The cause of death was mesenteric consumption (consumption of the bowels). His funeral took place the following Friday at Horbury Primitive Methodist Chapel. In 1924, a memorial tablet in oak and brass was placed in the chapel. After the demolition of the chapel, the plaque was re-housed in the Methodist Church next door, where it remains today. William Baines was buried at Horbury Cemetery. In his brief 23 years he composed around 150 pieces of music. The family grave shows that his younger brother Edward (Teddy) also died tragically young, the year after William, age only 17. 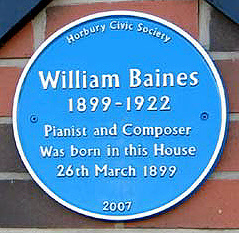 In 2007, Horbury Civic Society unveiled a blue plaque at 11 Shepstye Road, Horbury, William’s birthplace. 2. Richard Bell’s Wild Yorkshire Nature Diary "Celebrating Baines"
3. "Some Horbury Yesterdays" by R.D. Woodall. 1. The owner of 14, Barker Road, Horbury.